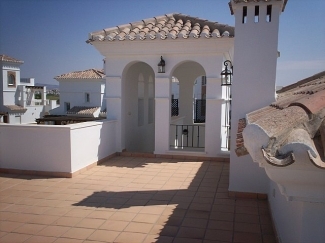 A beautifully furnished 2 bedroom detached southerly facing villa, with two levels, the entire top level being dedicated to a spacious roof terrace. Lovely garden furniture, set in lovely enclosed garden and a private pool, along with the chiminea BBQ, make this a great place to spend your evenings. An enclosed garden makes it ideal for families with small children. The villa is located within walking distance to the facilities on site (bars/restaurants) and yet far enough away not to be disrupted from noise. 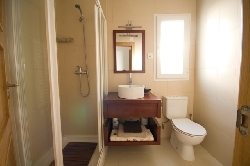 15 mins from San Javier airport and beaches. While staying in this property you will have unlimited use of (no membership payable, but green fees are payable) . The Club house has a pro shop and bar/ restaurant with terraces overlooking the driving range, entertaining even if not a golfer. There are numerous swimming pools, as well as tennis courts. There is also an on-site Supermarket with home delivery service.